Tentatsu's product Heshikosakearai has mild taste and it can be eaten raw, which is made from traditional Heshiko. Heshiko sakearai is not so salty and can be eaten raw, which is made from traditional Heshiko. Our company “Tentatsu” has original “Heshiko”. Traditional Heshiko is very salty and should be cooked before eating, but “Heshiko sakearai” is not so salty and can be eaten raw. “Heshiko“ is traditional food in Fukui , Japan. 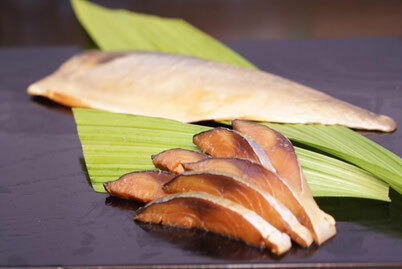 Heshiko is a fermented food made from fish pickled in rice bran for one year to increase its flavor. Heshiko is only found in Fukui. Often it’s strong salty taste and smell are supprising to people when they first try it. Incidentally ,I really like Heshiko. “Hshikosakearai” is made for people , who do not like Heshko’s strong salty taste. It’s made from traditional Heshiko, which is pickled in Japanese sake lees to reduce the amount of salty it contains. This gives it a mild taste. We sell both Heshiko and Heshikosakearai in our shop.Heshikosakearai is generally more popular than Heshiko. Heshiko is normally cooked before being eaten, but Heshikosakearai can be eaten raw. It’s easy to eat, just open the package and cut it into slice. It goes well with Japanese sake and rice and is good in pasta sauce and risotto. We want to introduce Heshikosakearai to everyone in the world.